Dharma Talk for "The Peace Conference of World Buddhist Bhikkhunis for the Reunification of North and South" was held at Grand Hilton Seoul on April 12, 2018. Around 400 bhikkhunis from diverse countries including Taiwan and Vietnam shared their wish for peace as the North-South Korea Summit and the North Korea-US Summit are planned in May or June. "The Peace Conference of World Buddhist Bhikkhunis for the Reunification of North and South" is hosted by World Buddhist Bhikkhunis Association and co-organized by Korea Branch of World Buddhist Bhikkhunis Association and Korean Bhiksuni Association of Jogye Order. This occasion is the first official event since World Buddhist Bhikkhuni Association was established in 2016. Bhikkhunis fom 12 different countries including Korea, Taiwan, Cambodia, Thailand, Malaysia, Singapore, Sri Lanka, Britain, and the U.S. have participated in the ceremony. At the Dharma talk, Ven. Seoljeong stated that "The season in which beautiful spring flowers offer each of their unique scent has come. All sentient beings in this world are sincerely waiting for the truthful teaching of Buddha. I am pleased to acknowledge that we – who practice as the students of the Buddha with a noble mission to save all sentient beings – have come together today." 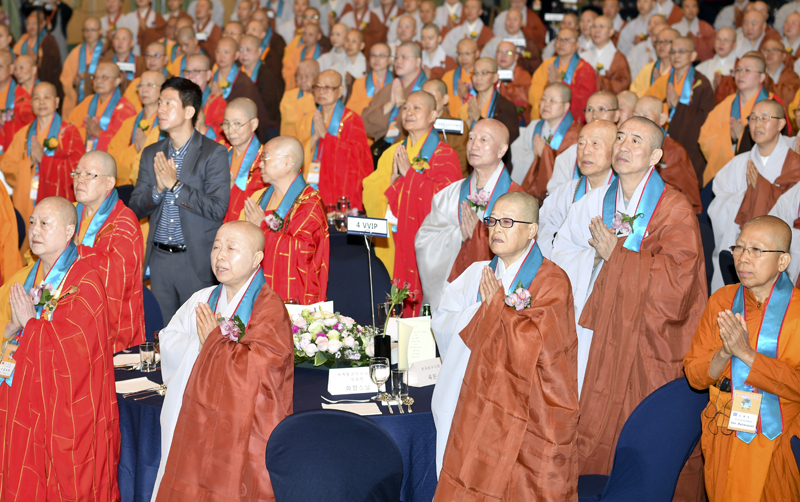 He also relayed his gratitude to the participating Bhikkhunis saying "All of you, the Bikkhunis of the world who have made your way to Korea to wish for peace and Korean unification under such circumstance are truly precious guests and reliable sisters of Korean Buddhism in the Dharma." Lastly, Ven. Seoljeong expressed his wish that "the assembly would be an opportunity to remind all citizens of the world of the significance of cooperation, peace and unification." "The Peace Conference of World Buddhist Bhikkhunis for the Reunification of North and South" will be continued in Seoul until April 15. With the Dharma talk marking the beginning of the conference, approximately 100 intenrnational Bhikkhunis and 300 Korean Bikkhunis will visit Korean traditional temples participating in cultural exchange and opportunity for close communication and cooperation.